The Medicomat-3 is newest therapy device from the Medicomat® series of fully automatic treatment units. Medicomat device is a combination of traditional Chinese acupuncture and the modern electronic technology, very safe, no penetration into skin, no side effect. Using the Medicomat is a very simple and painless, and most importantly, without any harm. Easy carrying and convenient, available to use at home, office, even on business trip etc. * 12 Treatment Modes - Acupuncture, Tapping, Cupping, Shiatus, Pressure, Back Pain, Body Building, Weight Loss,... Combination. Double Effect - the apparatus has two channels for electronic acupuncture massage therapy. You can use them simultaneously and choose two therapies at same time for the better therapeutic effect. * Rechargeable lithium battery * Adjustable timer for your convenience (10-60 minutes) * Digital touch screen Iphone size * Certification: CE, Rohs, ISO13485, FDA 510(K) * Easy to Operate. The World Health Organization (WHO) published an official report listing of symptoms, conditions that have been shown in controlled trials to be treated effectively by Acupuncture. Our goal for the next 10 years is to make Medicomat Apparatus to become a common home appliance into every family, just like a TV, mobile or computer. Package Includes: Main device: 1 piece + Ear electrode × 6 pairs + Ear Clip Electrode × 1 pair + Electrode pads × 2 pairs + Two-pin wire × 3 pieces + Power Adapter × 1 piece + Colour box × 1 box + Manual × 1 copy. 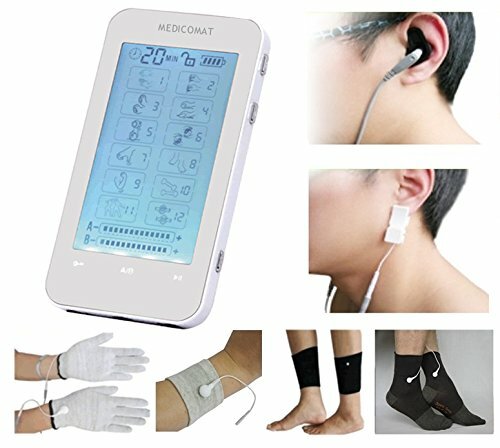 Fully Automatic Treatment at Home * Medicomat ear acupuncture provides a fully automatic treatment for the whole body, complemented by the effects of body acupuncture massage through the electrode pads and Socks Gloves Wristlet Ankle.